Smart Shopping Engine is new kind of shopping search engine, where huge number of products, and many categories are hand picked according to users needs. For example if user find something but don’t like a price, or don’t find product or service that he/she need, with one click, HowDoToDo team receives that request, finding most balanced price/quality set of product at targeted price, add to site and notify user via email about that. It is free, and user can send unlimited number of requests even for same product or service. Smart Shopping engine is kind of personal shopping advisor. 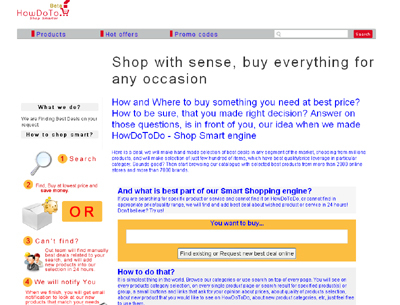 Smart Shopping Engine beats competition because provide better search results. Not in real time of course since our team need some time to find and include best offer for particular product or service.